Do you think of yourself as a trendsetter? How about being the first landscape in your neighborhood to have the newest plant varieties on display? I am always on the lookout for new plants that give a unique and often unexpected look to outdoor spaces awash in a sometimes overwhelming sea of bougainvillea, lantana and oleanders. The tradeshow associated with the conference had many vendors displaying the newest tools to make gardening easier, which I wrote about in a previous post. There were also many growers present showcasing the newest plants on the market along with new varieties of well-known plants. Walking through the booths filled with beautiful plants, I felt like a kid in a candy store. Everywhere you looked, there was a new plant drawing me in closer to read its tag to see if it could be grown in a hot, arid climate. Many of the growers handed out free plants to conference attendees so that they could try them out in their own gardens. Like I said before….I was a kid in a candy store where everything was free! This is a dwarf jacaranda, called ‘Bonsai Blue’, which grows 6 ft. tall and 5 ft. wide. This would be a great option for someone who had limited space but who wants this tropical plant along with its purple flowers decorating their outdoor space. I was excited to receive 3 ‘Brakelights’ red yucca (Hesperaloe parvifolia ‘Perpa’), which have darker red flowers than the traditional red yucca. I headed out to the Southern Living Plant and Sunset Western Garden Collection booth in search of plants that would thrive in my neck of the woods. Lovely varieties of autumn sage, nandina and other salvias were a feast for the eyes. Many of the new nandina varieties are compact, reaching 2 ft. high and tall. Many of the plants in their display were suitable for testing in my garden, so arrangements were made to send a variety to me to try out such as ‘Flirt’, ‘Lemon Lime’ and ‘Obsession’ varieties of nandina, which are more compact and offer a variety in foliar color. Another plant to look forward to receiving in the mail is ‘Little Kiss’ Salvia which has red and white bicolor flowers, much like ‘Hot Lips’ salvia, but is more compact in size, reaching 18 inches. In the meantime, I was given 2 ‘Meerlo’ lavender plants at the tradeshow, which have lovely variegated leaves giving an entirely new loook to lavender. High Country Gardens, is a mail-order nursery that specializes in drought tolerant and native perennials. I spoke to the owner, David Salmon about their newest plant introductions including ‘Showy’ pink milkweed (Asclepias speciosa). Salvias species such as autumn sage (Salvia greggii) and closely related, Salvia microphylla were on display. In low desert gardens, they bloom fall, winter and spring and do best when planted in partial shade. I picked up 3 varieties of Salvia microphylla from the of the Salvia Heatwave Collection to try in my home garden. They are purported to be more compact than the closely related Salvia greggii, while also being great in containers. Roses were also on prominent display, including many types of low-maintenance, groundcover roses such as these ‘Drift’ roses distributed by Star Roses and Plants. This new type of rose is a cross between groundcover roses and miniature roses making them perfect for the smaller garden. I received a single ‘Drift’ rose at the tradeshow, which now is now planted in my side garden. Other plants offered by this grower include the highly popular ‘Knockout’ roses as well as beautiful shrubs and perennials. A representative from my favorite grower of roses, David Austin Roses, was on hand, direct from England. These are shrub roses with old-fashioned blooms that are highly fragrant. I’ve grown several in my garden and was excited for the opportunity to try their newest rose introduction – ‘Olivia Rose Austin’, which isn’t available to the public yet. They will be sending me one this winter to plant in my garden. Believe it or not, I did pass up the offer of some free plants. Azaleas and gardenias would not grow well in the alkaline soils and while I wish that I could grow hydrangea – they do not like the dry, heat in the Southwest. ‘Wave’ petunias have taken the potted, flowering annual realm with their masses of blooms. The petunia flowers are smaller than regular petunias, which allows for more of them to grow closely together creating a mass of welcome color. 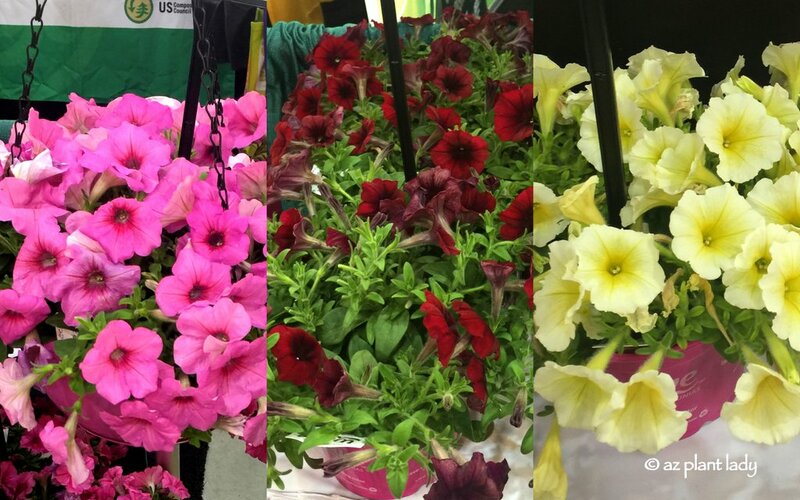 Several varieties were on display including the newest variety ‘Burgundy Velour’ with its deep red flowers. Petunias are my favorite cool-season flowering annual because they aren’t fussy and the newer ‘Wave’ varieties are simply stunning. You can find them at most local nurseries. It took me 2 afternoons to get through all the booths at the tradeshow and my bags were filled with plants as well as samples of the newest gardening tools and other items. I could hardly wait to get my new plants home and into the garden. So, how did I get them home on the airplane you may wonder? I brought two suitcases with me and carefully wrapped each plant in newspaper and then a plastic bag. I then used my dirty clothes to cushion the area around them in each suitcase.